Oh, To Be Rich in Ancient Sicily! 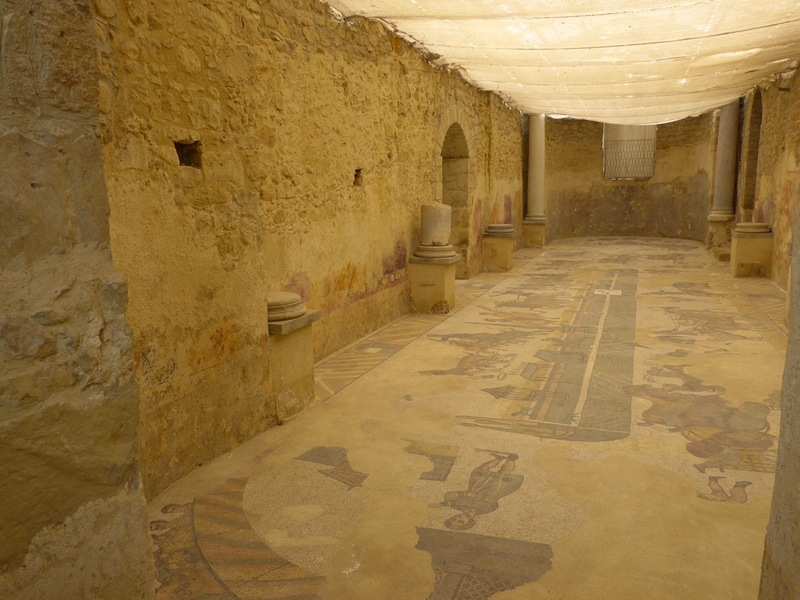 No one knows for sure who lived in the Villa Romana del Casale. 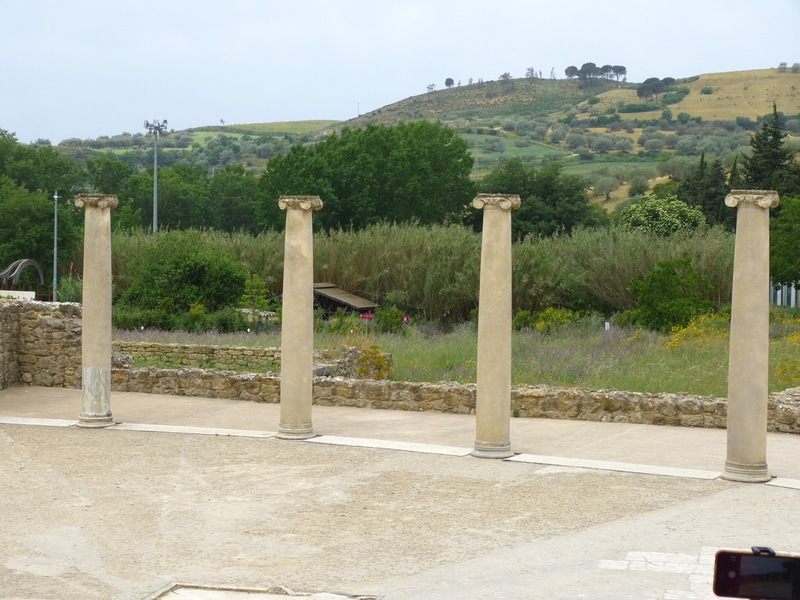 Some think it might have been the country home of Roman Emperor Marcus Aurelius; others theorize a provincial governor lived and conducted administrative duties here. It was constructed in the middle of the 4th century AD, and owes its remarkable preservation to the mudslide that covered the villa in the 12th century. The building remained hidden until the 1950’s excavations. 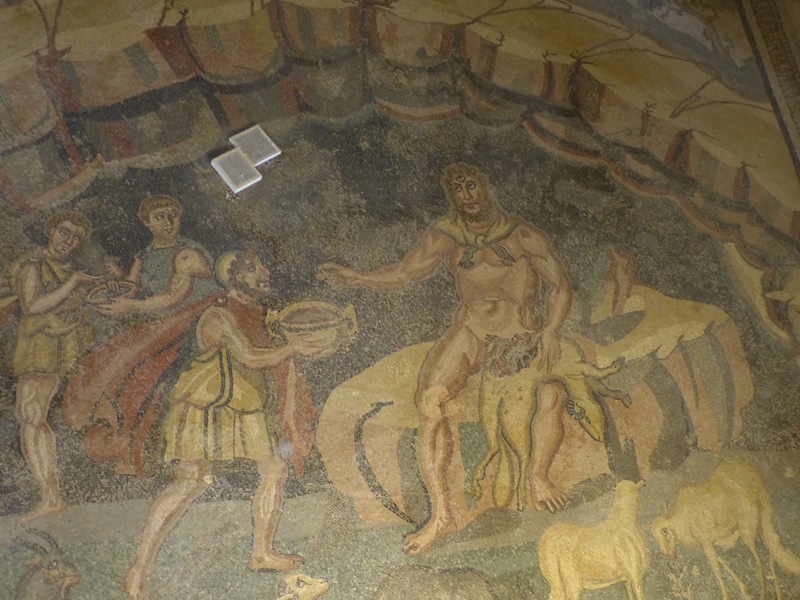 Katya, our local expert, explained that we were going to view some of the finest examples of Roman mosaics in all of Europe, with scenes ranging from Homeric escapades to depictions of daily life, at this UNESCO World Heritage Site. Katya was excellent, and that was true of all the local guides on our trip. We learned that our main guide, Daniel, had a choice of 4 or 5 different local guides for each site, and I have to say, he chose very well. Katya was interesting and so informative, a delight to listen to. 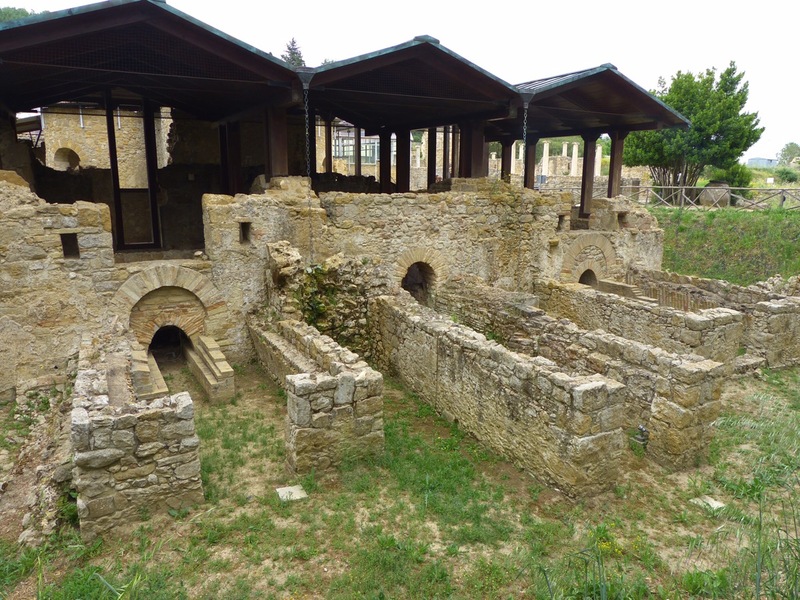 We began our tour by the aqueduct, which was the source of water for the baths–starting with the hot bath, and ending with the frigidarium, the cold bath. The slaves kept the fires going in these ovens so that the baths were at the proper temperature. I wasn’t taking notes, so don’t hold me to it, but I THINK this was the frigidarium. Or it was something else. Whatever. It was impressive. 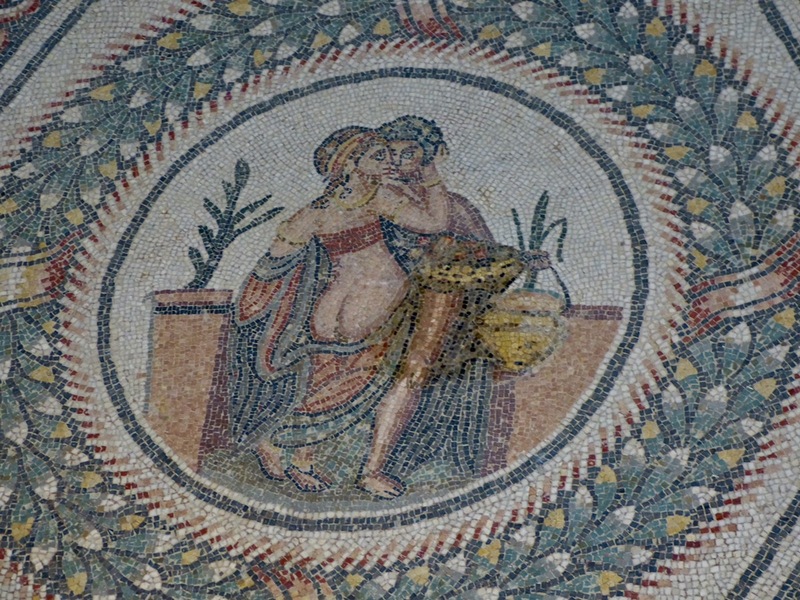 The main attraction of the villa is the floor mosaics, and they are absolutely magnificent. 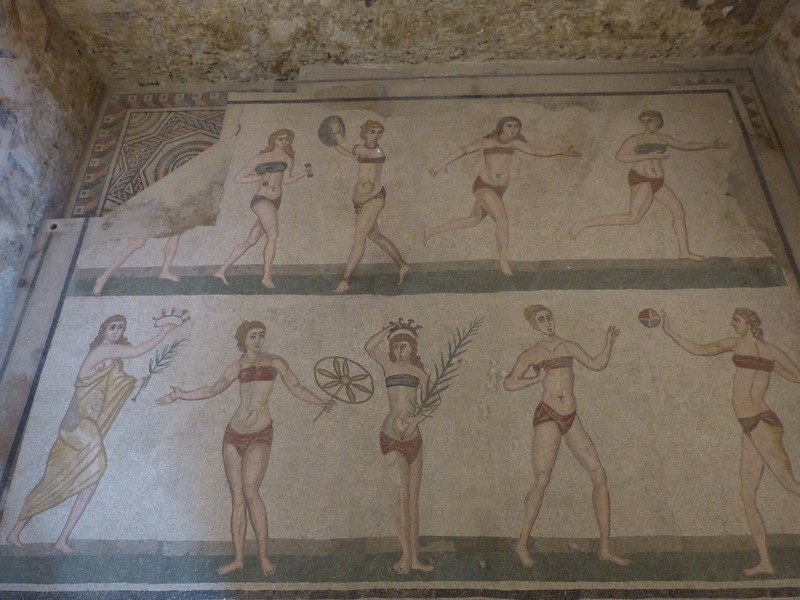 Probably the most famous room, the 10 maidens are exercising, wearing the ancient version of bikinis. And look, someone appears to have won the swimsuit competition, earning her a crown and a palm leaf to wave around. 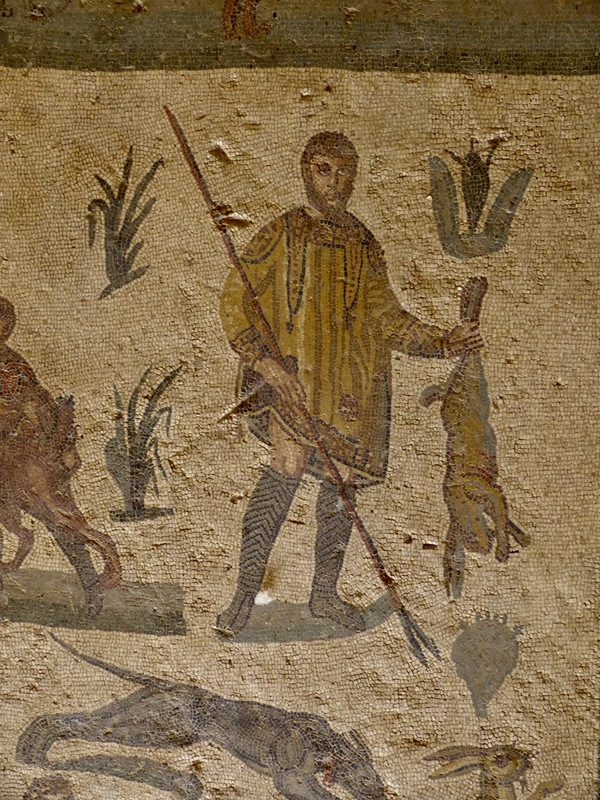 Not quite so famous, but certainly as intriguing were these: one example of the many scenes of a hunt. 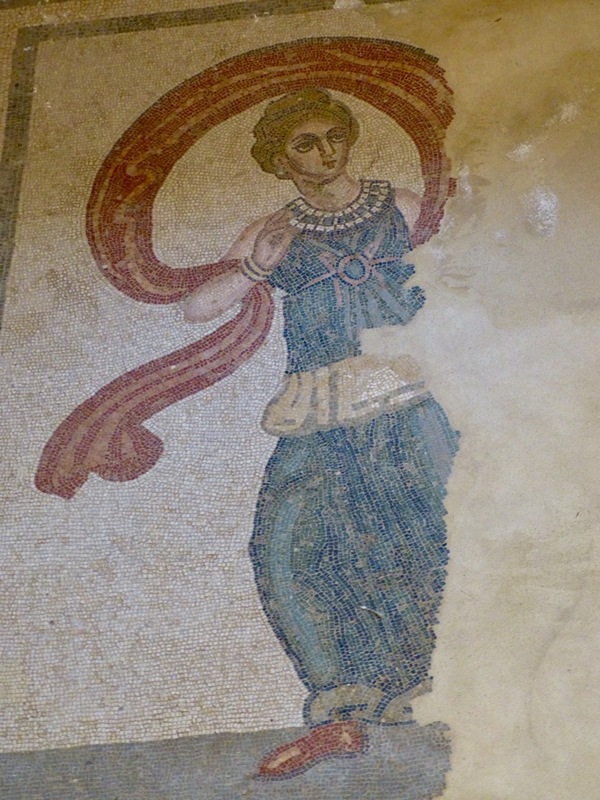 This woman’s clothing indicates she was from the eastern empire, possibly Muslim. There is another mosaic of a similarly attired woman, being carried off by soldiers. 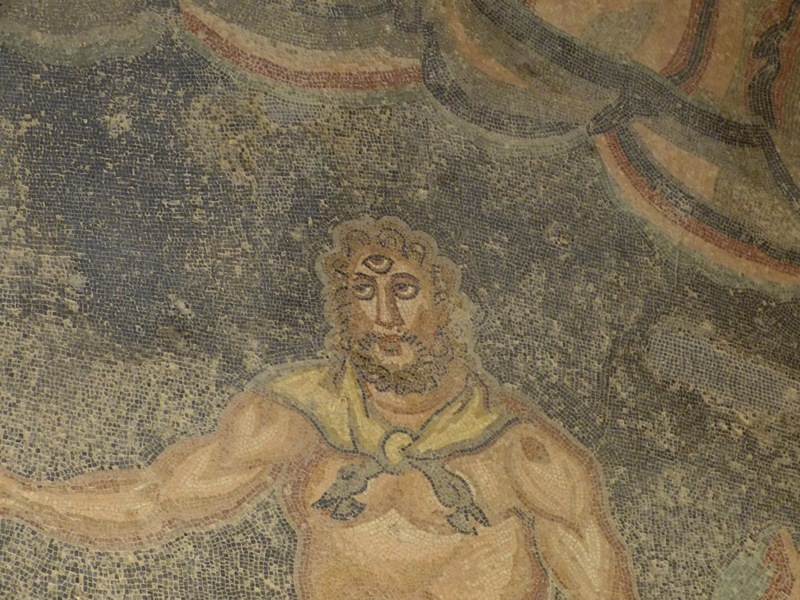 It isn’t hard to imagine what that mosaic was illustrating. I particularly liked the depiction of the theater. Looks like the legend of the Cyclops was being featured. Those white squares on the mosaic–I thought someone had been littering, but no. They were placed there intentionally to absorb moisture. Here’s a close up of Cyclops. I really DID like that mosaic! Isn’t it amazing what the craftsmen were able to do with little colored stones? One last look at the countryside and we’ll be on our way. Our timing was fantastic. We were leaving, just as hoards of tourists were arriving! 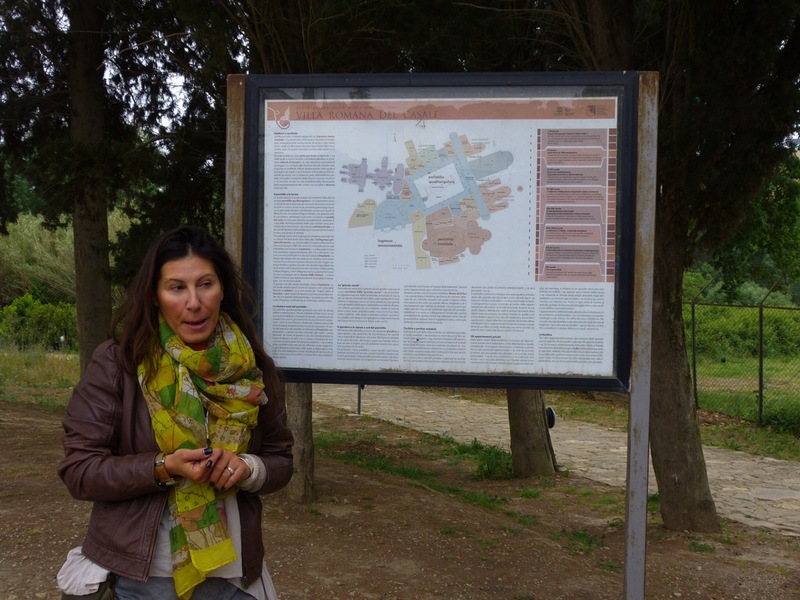 You would make an amazing tour guide! Thanks MRilyn, but I would never want to work that hard! Aww, thanks Lis. Home next Monday. Fascinating! I agree with Marilyn – you may have missed your calling as a tour guide! Thanks Nancy. Although the best option would have been for you to be with us, next best would be for you to put Sicily on your travel list. It was quite incredible! So very interesting. Thank you.